LONDON, ON, October 3, 2018 – Whether you’re a lifelong Toyota fan, considering moving up from another brand, or interested in kicking the tires on your first vehicle, North London Toyota is ready to offer an exceptional auto dealership experience with a brand new showroom and service centre for customers in the North London area. North London Toyota is well known in this Southwestern Ontario hub for its community involvement. The dealer is a proud partner in Make-A-Wish Southwestern Ontario and supports numerous youth sports teams as well as various local charities. Now, North London Toyota has made another commitment to the community, cutting the ribbon on an all-new 36,000 square foot facility complete with an additional 40,000 square foot underground storage area. The modern showroom has room for 14 vehicles indoors, with a long list of amenities for shoppers. These include a spacious lounge with a children’s play area, plus a new Corolla Café to make vehicle shopping a pleasant, stress-free experience. Toyota Dealerships across Canada have a reputation for excellent customer service, and North London Toyota continues to demonstrate why this is so. As an example, the new dealership features a nine-bay drive-through enclosed service reception area and underground storage for up to 120 vehicles, so customers can drop off and pick up their Toyota in comfort, regardless of the weather. A 16-bay service area facilitates prompt servicing, including Express Lube services and an on-site soft-touch car wash to keep every Toyota looking its best. 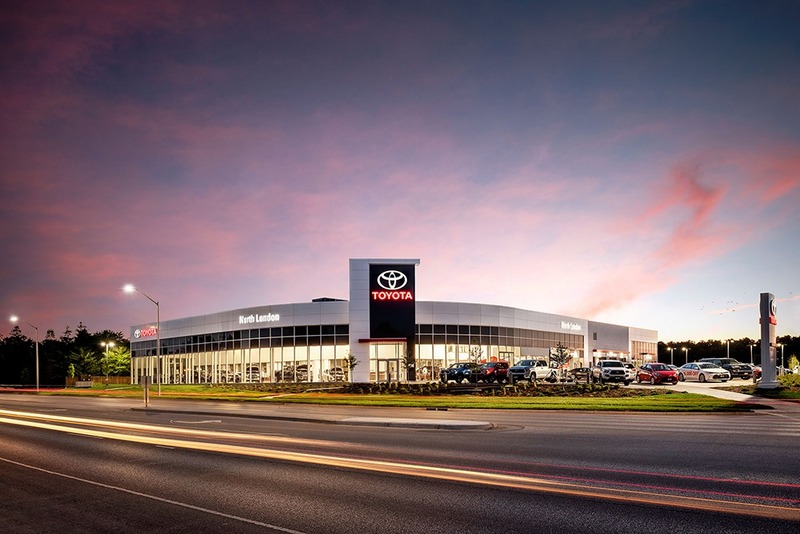 The new North London Toyota showroom and service centre is located at 1515 Rob Panzer Drive (near Highbury Avenue North and Fanshawe Park Road East) in London, Ontario. For more on the dealership, visit www.northlondontoyota.com.